Robert Frost mused famously on a magical fork in the road where you can choose the path you are on, or the road less travelled. I am not sure it’s quite that elegant, simple or straightforward. I would liken it more to being on a plane with a group of friends going skydiving for the first time. When that light goes off in the cabin you have two choices. One, you simply refuse to jump and live your life with regrets and constant ridicule. The second choice is you swallow your pride, step forward perhaps terrified to your wits end, and then throw yourself out there into an environment that you cannot control. I haven’t tried skydiving because I am not quite prepared for either scenario, but figuratively this was what it was like to travel overseas for the first time. It was a step outside the comfort zone, awkward, and even a bit scary to step into the great unknown. I knew I would have to journey to a Spanish-speaking country to become fluent in Spanish. Knowing another language was becoming extremely important, especially for those who wanted to work in the international business environment. The signs were all around us. NAFTA had created the largest free trade zone in the world stretching from the Arctic Circle to the Guatemalan border in Central America. Investment was pouring into the southeastern United States from Europe and Asia with new languages and cultures. Learning to do business with our new partners required not simply understanding their cultures, but also speaking their language. That’s not something many Americans typically stepped forward to do. I mean, after all, this is the United States and they are supposed to speak our language, right? Not exactly. Spanish was beginning to emerge from being the language of just one large ethnic group of Hispanics to a de-facto, second language in the nation. Within a few years, Hispanics would overtake African Americans as the largest minority group, and by 2020, America would pass Spain as the second largest country of Spanish speakers in the world (only behind Mexico). Because of the ethnic diversity of the Hispanic groups in the United States, one of the few things that they shared culturally was their Spanish language, which varies in grammar, dialects and accents quite a bit. Because of the importance of Spanish, I definitely needed to hone my skills. One important decision I had to make was where to best polish it. My university offered a study abroad program in Spain where they teach the “pure” form of Castilian Spanish, so that was suddenly where I needed to go. However, language certainly wasn’t the only reason I wanted to go. Certainly, it was a fascination with all contrived images I had of Spain, including the corridas de toros (bullfights), flamenco, señoritas, Don Quixote’s windmills and beautiful Mediterranean beaches. What I would later learn was I truly didn’t have a clue. Today it seems easy to decide on going on a vacation overseas. But before I ventured outside my comfort zone for the first time, it all seemed a bit unnerving. It’s true that I knew the language basics of the country I was visiting, and the anxiety wasn’t as I high as it could have been. However, I began to doubt if my language skills were up to par or if I would be able to order a meal and not starve! And if I could order food, that raised the question of whether I would like it. Then there were the issues of what to pack, what kind of electrical converter did I need, etc. Then were the preparation items that I needed to handle before leaving that I didn’t think about every day. What would I do about getting Spanish currency, how could I verify my credit card and ATM card would work, or what would happen if I became sick? The preparation was much more intensive than a road trip across America. Suddenly, packing was not such a quick job and the initial excitement gave way to nervousness. The end of May came quicker than imagined. Earlier that month, I still didn’t have a passport yet. When my passport finally arrived in the mail from New Orleans, it was a very proud moment. Now I was officially a man of the world, or so I thought! The pages were as barren as a baby’s behind: no stamps, no visa, nothing linking me to the rest of the world. It was at that moment that it finally hit me. I had never been anywhere. For as much as I thought I knew about the world from books, television or film, I didn’t really know anything. I had never experienced the world firsthand. After that passport realization, I went on to not only visit Spain, but live with a madrileño family in Madrid for four short weeks. That time in the Spanish capital was formative. I ate foods like paella and went tapas sampling. I went out and met interesting people in places like Retiro Park, danced at the discotheques, learned to navigate the Madrid metro system, became enthralled with the Eurocopa and La Liga soccer of Real Madrid and Atlético Madrid, opened my eyes to art for the first time at the Reina Sofia and Museo del Prado, and listened to new kinds of music. Some things took a little more getting used to such as living in a huge urban environment, understanding the body language of people who talked more with their hands and learning not to back away from people who had much closer limits of personal space and proximity during conversations. Overall, it opened a whole world up to me that I had never experienced before. It was almost like a curtain had been lifted in front of my eyes. Suddenly I began to understand most of the Spanish around me. I began to speak to madrileños not as foreigner in English, but in Spanish. Nothing would have prepared me for how far this short learning trip would go. On one of my last nights in Madrid before traveling with friends for a week in Andalucia, I dreamt in Spanish. I awoke up the next morning perplexed. This experience had awaken a sleeping giant. In the future, I would judge many trips by the beauty of the Alhambra in Granada, the grandeur of Toledo, navigation of the Madrid metro system and viewing the magnificent art of the Museo del Prado. 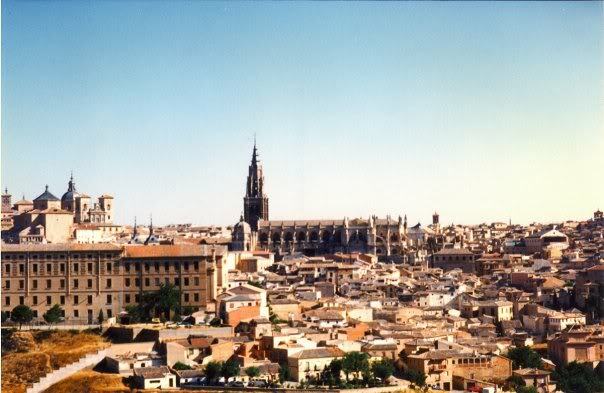 I would forever reflect on the history of Segovia and Cordoba, the mysticism of Avila, the romance of Sevilla, the gigantic Pirineos of tiny Andorra, or the paradoxical blending of the modern and ancient along the Costa del Sol of the Spanish Mediterranean. Everywhere in Spain, the tastebuds of my travel appetite had been stimulated thoroughly. And little did I know that I would observe even more amazing wonders in unexpected parts of the world for years to come.